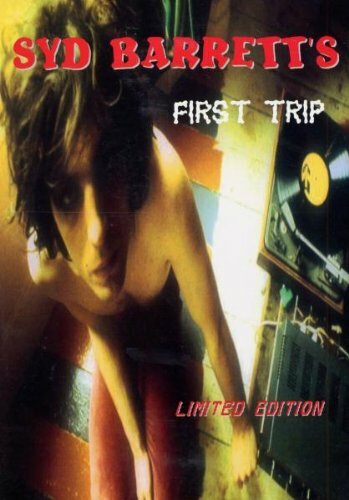 The Walmart in my hometown used to stock a DVD called Syd Barrett’s First Trip. It must have been on the shelves sometime around 2002-2004, because I must have been somewhere in the vicinity of 12 to 14 years old at the time. I know this because I hadn’t heard any of Barrett’s music yet, but I had heard Wish You Were Here, so I basically knew the story. One version of it, anyway. But even that fails to quite get at the largest manipulation at play in this pirated package. From the look of it, and with a small bit of background knowledge about Barrett’s seemingly drug-induced decline into acute mental illness, you might expect that the image you see on the front of the case would be a still taken from the film within it. It is not. The orange and black paint on the floor indicates that the photo must come from around the time (and perhaps the same photoshoot) as the album cover for The Madcap Laughs, Barrett’s 1970 solo debut, released after his expulsion from Pink Floyd in a period of intense personal distress. The film itself was made in more innocent times: 1966, before Pink Floyd had recorded any music at all. And if a still from the film had been used to promote the DVD, all promise of depravity and derangement would have evaporated into a thin mist of tasteful pointlessness. I’ll refrain from linking to it, but the video can usually be found online. It was directed by Barrett’s friend, Nigel Lesmoir-Gordon, who later described the film as having “a certain nostalgic charm.” It shows a young, clean-cut Barrett, with his trademark perm still some time in the future, tripping on LSD in the Gog Magog hills. Barrett meanders about. He lies in the grass. He places mushrooms over his eyes (normal field mushrooms — entirely un-psychedelic). He looks completely unlike the tormented poet on the cover shot, and by all accounts they were in fact two very different Syds. This is innocuous home video footage: by friends, for friends. But in the late ’70s, at which point Barrett was living in seclusion, Lesmoir-Gordon began showing the film publicly under its most recognized title: Syd Barrett’s First Trip. We can speculate about his motives, but the fact that he only publicized the footage once Barrett had acquired a cult following as much for his tragic myth as for his music says something, if not everything. And the fans who gathered to gawk started a chain reaction that led directly to Gilmour’s acquisition of the rights in an attempt to scatter the rubberneckers, and eventually to the pirated DVD’s arrival in Walmart’s movie racks, packaged in a lie. But whether they knew it or not, when they chose that picture of Barrett for the cover; when they stuck with Lesmoir-Gordon’s inaccurate, sensationalist title; the pirates completed the narrative that the film they were hawking only told in part. The story of Syd Barrett is all present, here. The fey, arty innocent of the pre-fame days is represented in the film. The ailing burnout from scant years after is there on the cover. It’s two frames of the fall from grace: the forbidden fruit and the Land of Nod. If there’s an album that dramatises Barrett’s fall as effectively as this, it isn’t Wish You Were Here. It isn’t even The Madcap Laughs. It’s the quintessential “difficult second album”: A Saucerful of Secrets, on which Barrett’s tragedy is most acutely expressed through his absence. Let’s double back. We’ve already seen how EMI staffers managed to coral Pink Floyd into focusing more on songs than formless improvisations when they were in the recording studio. But what were those songs were actually like? More to the point: what kind of songwriter was Syd Barrett, and what did Pink Floyd lose when they lost him? Barrett’s biographers portray him as being temperamentally different from his Pink Floyd bandmates in one crucial way: he never wanted to be a rock star. Roger Waters, for his part, made his dreams of fame and fortune entirely clear in early interviews. On the other hand, to hear some of Barrett’s art school friends tell the story, he would have just as soon been an obscure painter. He used to give away his best pieces. In keeping with this, it wouldn’t surprise me if Barrett’s songs didn’t strike him as unorthodox at all, but rather tossed-off with no effort expended towards making them conform to normal standards. In other words, his songs are not meticulously constructed with the goal of subverting convention or accruing complexity: they just turn out like this. Barrett had enough intuition that he probably never needed to obsess over records the way that many aspiring pop musicians do. Thus his songwriting is defined by absences: the absence of imitation, and the absence of conventional structure. “Arnold Layne,” “Astronomy Domine,” “Bike,” and “See Emily Play” are the masterpieces of an artist who never intellectualised his process. It’s worth noting that by the time Barrett recorded The Madcap Laughs his sense of rhythm and phrasing (which, as we’ve already seen, was odd at the best of times) had become so unpredictable that even Soft Machine, the most sophisticated jazz fusion band in England, had trouble playing along to his solo tracks. You could easily ascribe this to his declining mental state, and you’d probably be mostly right. But in the absence of early demos, we can’t say for sure that the songs on Piper didn’t sound like that as well, before Pink Floyd had the chance to rehearse and hone them into something that they could keep track of. After all, it was the other three who were the professionals. Lest it sound like I’m being derisive: if I’m correct in my hypotheses about Barrett’s songwriting methods, then he was a songwriter of nearly unprecedented intuition — and far more of a miraculous anomaly than if he were the calculating genius he’d have to have been if I’m wrong. Even the album’s relatively freeform title track, Saucerful‘s analogue to “Interstellar Overdrive,” was based on a sort of graphical score dreamed up by Waters and Mason — the sort of thing you might expect from an avant-garde composer like John Cage or Cornelius Cardew. When you listen critically to the songs on Saucerful that aren’t credited to Barrett (all of them but “Jugband Blues,” in a total inversion of the credits on Piper), they sound far less desperate than you might expect from a band who just lost its leading light. (Cf. the Velvet Underground, post-Lou Reed.) Rather, they just sound more considered than Barrett’s songs did — less instinctual. The Piper at the Gates of Dawn showed us a band who was relishing the act of simply being Pink Floyd. A Saucerful of Secrets shows us a band that’s actively engaged in the labour of continuing to be Pink Floyd. And then it ends with “Jugband Blues,” maybe the saddest song ever written. In his final moments on a Pink Floyd record, the rapidly deteriorating Syd Barrett takes advantage of a rare moment of lucidity to tell us exactly how it feels inside his brain. It is, not coincidentally, his most structurally capricious song of all. A Saucerful of Secrets sounds like phase one of the heat death of psychedelia. It sounds like what happens between Syd Barrett’s First Trip and the cover shot of Syd Barrett’s First Trip. It also marks the start of one of the longest and most fascinating transitional periods in any rock discography. Pink Floyd’s music from 1968 to 1973 is far more than just the long march to The Dark Side of the Moon, but in retrospect it seems astonishing how long they persevered before all the pieces fell back into place. The members of Pink Floyd were rock’s ultimate strivers. Soon enough, that would become the norm. This is the first entry in Circus of Heaven, a blog about the history of progressive rock. You can read the introduction here, and find the ongoing annotated bibliography here. It’s spring of 1967, and there’s an invisible line splitting EMI Studios into halves. One one side of the line, the biggest band in history is recording the biggest album in history. On the other, a band that’s unknown outside of London’s psychedelic underground is making its debut record. The biggest band in history is recording in Studio Two: a spacious, attractive facility with multiple pianos and a mixing booth atop a flight of stairs, where the producer can preside from on high. The underground darlings are shacked up in Studio Three: smaller, cozier, the one that EMI puts you in when the biggest band in history needs Studio Two. The biggest band in history knows they’re making what’s probably going to be the biggest album in history, so they’ve brought in a 40-piece orchestra of top London musicians to mark the occasion. The underground darlings have plenty of what we now call “buzz,” but they’re yet to really get a toehold in the music business. In lieu of the orchestra next door, they’ve filled up Studio Three with bizarre-sounding clocks — alarm clocks, cuckoo clocks, grandfather clocks — that they just dug out from studio storage. This LP is make or break, and there simply must be many, many clocks. A few months before these recording sessions, the younger band had given one of their first broadcast interviews on CBC Radio. The Canadian reporter (whose name is apparently lost to history) may have been surprised to find them a group of fairly soft-spoken young lads, given what she’d experienced when she brought her microphone to one of their concerts: an elaborate light show that transformed the room into the inside of a lava lamp; youths on LSD dancing, trancelike, and just as many lying on the floor; and the sound of four stoned men thrashing about on their instruments with little reference to any sequence of chords. She doesn’t even try to keep the concern out of her voice. But it’s a fair question. Just when popular music seems to be reaching a new peak of sophistication, must it descend once again into the swamp? In retrospect, the reporter’s appraisal of the Beatles as an especially professional group of rock musicians seems more prescient than obvious, as they were yet to release the album that their present-day reputation for meticulousness largely rests upon. That album is Sgt. Pepper’s Lonely Hearts Club Band, which is the (biggest) album (in history) that the Beatles were recording in Studio Two while the members of Pink Floyd were down the hall with their clocks. It’s not that the Beatles’ previous records had not been ambitious, or detailed, or groundbreaking. Certainly 1966’s Revolver set a high bar for songwriting, recording and audio post production. But while much of that record felt and still feels like mad science — a horde of voracious pioneers let loose in a room full of the latest gizmos — Sgt. Pepper feels like a deliberate, controlled attempt to make a perfect rock record. Every line, every chord, every tape splice seems fussed over and probably was, given the unprecedented amount of time that the Beatles took to make the record. Famously, it worked. Pepper has come to be regarded as the Hamlet/Citizen Kane/Parthenon of rock music. And it attained this status thanks to the discipline the Beatles had exercised within the framework of a genre that scant years prior had been widely (and condescendingly, and erroneously) dismissed as vapid and artless. The credit for this rests largely with Paul McCartney who, though certain detractors of his may deny it, wrote the bulk of the album. And the album is piled high with McCartney’s particular obsessions. Where previous Beatles albums had been mostly constructed out of disparate sounds that were in vogue at the time (rock and roll, acoustic folk, psychedelia, etc. ), much of Pepper is built out of novelty songs, musical theatre, Tin Pan Alley, and brass band music. Ironically, the very innovations that made Pepper seem so, shall we say, progressive in its time mostly came from many decades prior. That CBC reporter must have adored it. In case it isn’t clear, so do I. The sessions down the hall were being produced by a former colleague of McCartney’s named Norman Smith. He’d been a staff engineer at EMI for some time, often working as Beatles producer George Martin’s right-hand man. But, having been recently promoted to producer, Smith had been tasked with reining in the enthusiastic newbies who he had been partially responsible for signing. Even so, Smith had his reservations about “the Pink Floyd,” as they were then known. He, along with the rest of Swinging London’s countercultural intelligentsia, had seen the band during its residency at the UFO Club (pronounced OO-foe, for some reason). This was a place that opened at ten in the evening and closed at eight in the morning, yet had no liquor license. It wasn’t seen to be necessary, since alcohol was nobody’s intoxicant of choice at a Pink Floyd show. If we are to trust the available video footage as representative, you can see why Smith might well have run for the hills. Though their frontman and guitarist Syd Barrett was a gifted songwriter, the band’s live set was padded out by rambling jams over one chord, at a deafening volume. But the crowds at UFO ate it up, came back again and again, and danced with ever-increasing mania. Smith couldn’t ignore that. So he put his Beatles credentials to one side, and instead of engineering the most meticulous record of the ‘60s, he did his level best to wrangle that live show into something releasable on vinyl from the control room of Studio Three. And wrangle he did. The version of Pink Floyd that turns up on The Piper at the Gates of Dawn has lost both a definite article and a substantial amount of their alienating strangeness. The record, while certainly out of the ordinary (remember the clocks), is a far cry from those Dionysian UFO gigs. Songs like “Astronomy Domine,” “Flaming” and “Take Up Thy Stethoscope and Walk” may be noisy, but they’re songs. Even “Pow R. Toc H.,” an instrumental that could stretch to twelve minutes live, was chopped down to four and a half and given a discrete structure. The most trustworthy first-person accounts of the early Pink Floyd experience all place enormous importance on “Interstellar Overdrive”: the most sprawling of the sprawling improvisatory works that formed the core of the band’s shows. It sounds dramatically different in every existing recording, but it always starts with the riff — a truly legendary riff from a band who would never be known for them. Then, the bassline: a cheery thing in a counterintuitive major key. And then… anything. Noise. Madness. An abstract jam where neither instrumental prowess nor knowledge enter into it. At a certain point in every recorded performance of the song, Pink Floyd audibly ceases to treat their instruments as musical devices, purpose-built for the production of notes and chords. Instead, they seem to conceive of them as foreign objects that unexpectedly produce sound when touched. Only once their primitive, childlike exploration of their newfound toys reaches fever pitch does the riff return, and civilization along with it. This, to those who were there, was the sound of Swinging London. And Norman Smith knew better than to leave it off the album. With that in mind, it’s probably best to characterize Pink Floyd circa ‘67 as a chaotic band who had made a not entirely chaotic record. And of course it wasn’t entirely chaotic. Nothing is that simple, and indeed, it would be equally wrong to characterize Sgt. Pepper as a record without a certain amount of chaos. Its most acclaimed moment is an entirely aleatoric orchestral crescendo (ironically, a McCartney contribution to a Lennon track, proving that there was no singular agent of chaos in the Beatles). The entire structural conceit of “A Day in the Life” is that it occasionally comes apart at the seams, only to right its balance at the last possible moment. And “Being for the Benefit of Mr. Kite!” would sit reasonably well on Piper, if it were played a bit more poorly. Let’s take stock of what we have, here. We have a famously meticulous masterpiece that periodically comes unglued in spite of itself. And, we have a record that brims with manic energy and is only trying to contain itself so that EMI will actually release it. We have the yin and the yang. How very psychedelic. I am not the first writer to attempt to define psychedelia in this way. Barrett biographer Rob Chapman referred to the Beatles’ double A-side “Penny Lane” and “Strawberry Fields Forever” as the yin and the yang of psychedelia. However, I propose a broader schema. I submit that any psychedelic album can be classified, roughly, as either a Pepper or a Piper. The Peppers are psychedelia’s brightly-coloured jigsaw puzzles: Forever Changes, Pet Sounds, Days of Future Passed. They are as ecstatic and expressive as their era requires them to be, but they are consciously constructed. The Pipers are psychedelia’s fingerpainting: The Psychedelic Sounds of the 13th Floor Elevators, Their Satanic Majesties Request, the first Doors record. They’ve got a lot of energy and not a lot of restraint. It’s possible that I did a bit of cherry picking when I compiled those lists in order to make this next point, but I do believe this to be true: the Peppers have aged better. This applies both in the general case, and in the specific case of the two albums that the categories are named for. The Piper at the Gates of Dawn has many pleasures to offer modern listeners, but it feels of its time in a way that Sgt. Pepper’s Lonely Hearts Club Band never will. It is fruitless to speculate on why this is, especially given the extent to which it is a matter of taste. But I’ll take this opportunity to state an opinion that will likely become an axiom as this project goes on: craftsmanship does not age. Is it any wonder that Pepper is still so revered, given the lengths that the Beatles went? Is it any wonder that Piper is now a niche product? Hindsight has proven that anonymous CBC reporter’s anxieties about the future of music to have been unfounded. In the coming years the Beatles would themselves flirt with chaos on the White Album, but they’d return decisively to order by the time of Abbey Road (incidentally, an album that made EMI Studios’ street address so famous that they renamed the facility Abbey Road Studios). The more untethered strains of psychedelia continued to spread tendrils of influence throughout the music of the coming decade — in the hazy jamming of the early 70s Canterbury scene, or in Led Zeppelin’s more spontaneous moments, for instance. But in the wake of Sgt. Pepper, a segment of British rock and roll began striving towards a similar image of perfection. By 1973, an ever more sophisticated Pink Floyd would be one of the bands at this movement’s forefront. In 1978 — eleven years post-Pepper, post-Piper — the Canadian band Rush will record a conceptual suite called “Hemispheres.” At that time, it will be considered a late vestige of the hazily-defined music that we call progressive rock. The track’s narrative will pit the two halves of the human brain against each other, and it will offer a vision of what you might find in each half. In the left hemisphere, reason; in the right, intuition. In the left hemisphere, Apollo; in the right Dionysus. In the left hemisphere, Paul McCartney; in the right, Syd Barrett. In the spring of 1967, EMI Studios was a microcosm of the left and right brains of rock and roll. The hemispheres operated in tandem, with a sense of balance, and synapses firing across the cerebral fissure. But the right brain was about to suffer a major setback, and the progress from Dionysian frenzy to Apollonian order would continue apace.